So despite a small snag and my blog being down for most of the night and today, here it is. 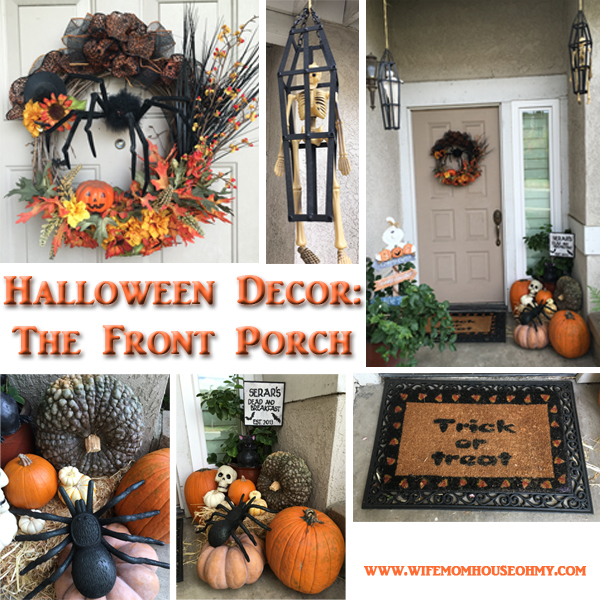 My 2015 Halloween crafts and décor all finished and displayed inside and outside. 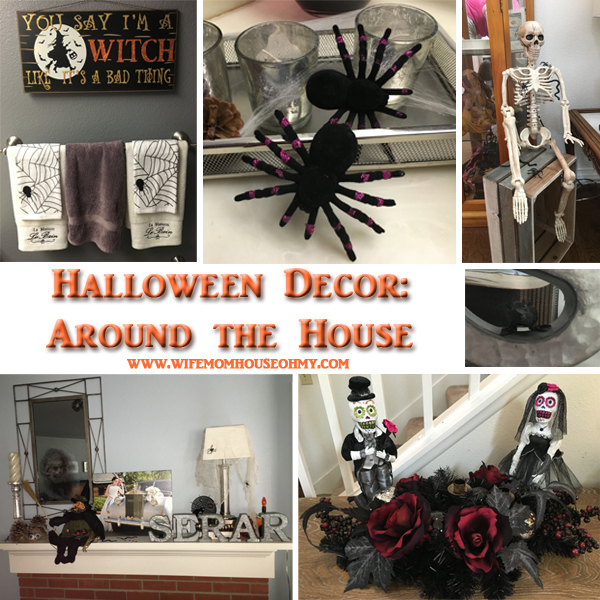 I had a blast creating these Halloween crafts and building these fun, creepy vignettes and I hope you enjoy them as much as I do. As I mentioned in previous posts, I am going for a macabre feeling versus a fun and goofy feeling this year. I love the heritage pumpkin the best. Its the bumpy green wart looking pumpkin. Funny story – I got this pumpkin at Albertson’s and no one knew what kind of pumpkin it was. The clerk was a little grossed out and didn’t really want to touch it. He asked the manager. When the manager turned around, his eyes grew so big, they almost popped out of his head. It was without a doubt the funniest thing I have ever witnessed. Grown men afraid of a pumpkin. The Serar’s Dead and Breakfast sign looks awesome next to the skull and huge spider and a female rat with her hands on her hips. The spider wreath is a wreath I made several years back. My husband hates spiders so I think that’s partly why I like this wreath so much. The fuzzy spider in the center just leaps out of the center and I love teasing him. Most of the items were about $1 to $2 each. 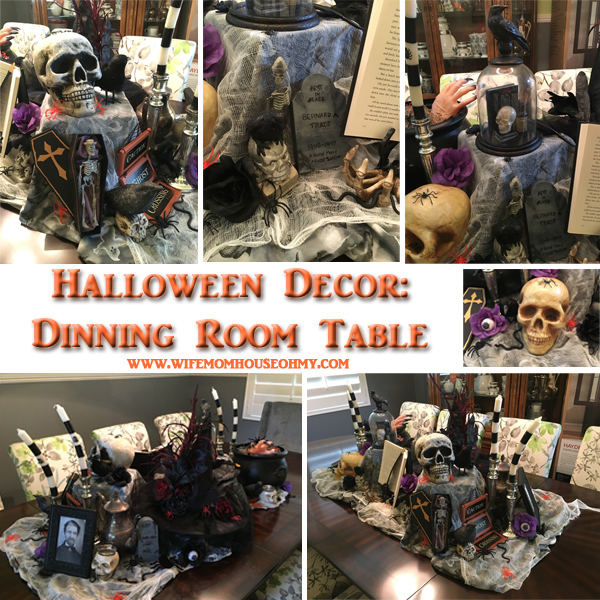 The dinning room table setting is my Halloween baby per say. Literally everything on this table was purchased at the Dollar Tree, the 99 Cent Store or JoAnn Craft Store…oh except the silver teapot that I inherited from my grandmother and the candlesticks which I purchased at Home Goods for last year’s Halloween dinning room table setting. They were without a doubt the best purchase ever as I have used them tons for dinner parties, decorations, and, well, candle holders (how novel right). I know I am biased but I think the gravestones and the coffins look perfect among the ravens, skulls and spiders. I had a few extra eyeball flowers from the eyeball flowers and vase craft and decided they would make a perfect accent to the table setting. And what macabre Halloween setting would be complete with out a witch’s cauldron filled with all sorts of morbid items, even a severed hand. As I said, my husband doesn’t really like spiders. In fact, I had one sitting on the Q-tip jar and I rolled on the floor laughing as my husband standing at arm’s length and flicked a fake glitter spider off so he could safely get a Q-tip. (Okay…it may seem slightly wrong but if you’d met my prankster comedy man husband, you’d be cheering me on right now.) So I let the spiders run rampant. Spiders and spider webs in the bathroom, on the towels, in the cheesecloth on the lamps, weaved into the pine cones and even the cool sitting skeleton. One little not so Halloween décor item are my Dia de los Muerta dolls. Yes, they are skeletons. Yes, they are fitting for the Halloween vignette that sits on my buffet that will host my food display for this year’s Halloween movie night. But the reason they are there is my husband fell in love with them when he saw them at Michael’s. (A little on the morbid side, he says they represent us from when we were bride and groom.) I think they are cool and, well, I can use them to teach my future babies about cultural diversity and other cultural festivals and holidays (yes I know, probably a little overkill but I love them). All in all, I think my vision came to fruition. I’d love to know what you think? Is there a Halloween craft or décor item that you like best?